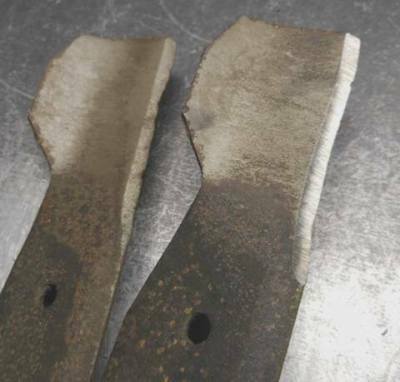 ​Mower blades should be sharpened twice a season, or whenever they are damaged by rocks or sticks. Blades should be balanced every time they are sharpened. We sharpen and balance your blade before we return it to you. Keep your mower blades sharp all season with our drop-off sharpening service. Dull blades (the blade on the left in the photo) will shred the grass plants leaving a whiteish cast to the lawn and leave the plant suseptial to disease. A sharp blades (the blade on the right in the photo) will make a clean cut without shredding the blade tip. Drop mower blades off at the shop before 11:00 am and we'll sharpen & balance them, and have them ready for pick-up the next business day. When you bring your mower in for service we will remove the blades and sharpen them as part our standard service program. EZ Mower care customers will also have the blades sharpened. We recommend that you sharpen the blades mid-season to insure a clean cut through the remainder of the cutting season. If blades need to be replaced we carry OEM blades for most popular brands of lawn mowers. Many customers keep an extra set of blades on hand and switch blades mid-season as recommended above. Chain saw chains need to be sharp to cut well, and be safe. (A dull chain can lead to kick-back, a very dangerous situation.) Keep your chain saw chains sharp with our drop-off sharpening service. A dull chain saw chain will produce saw dust like material and require excess downward pressure on the chain saw to cut through the material. 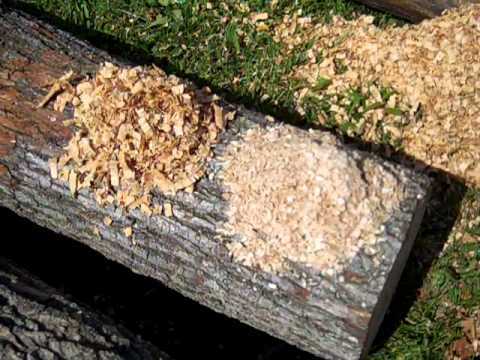 A sharp chain will produce wood chip like material and almost no downward pressure on the saw to cut through material. Drop your chain off before 11:00 am and we'll sharpen them to a honed edge, and have them ready for pick-up the next business day. If you bring your chain saw in for service we will remove the blades and sharpen them as part our standard service program. If chains need to be replaced we carry OEM chains for Stihl and most popular brands of chain saws. We can make chains in whatever length you require. Just bring in an old chain and we'll create the perfect replacement. We can also sharpen a limited number of garden tools such as axes, hedge shears, edger blades, and some hedge trimmer blades. Pricing is on an individual basis and is based on time required and method needed. Quick turn around is not always available for these devices. We DO NOT sharpen reel mower blades, circular saw blades, traditional carpenter saws, or household knives and scissors.